> Suggestions anyone? Long about Friday I will recive a UNIFENCE 30" for my table saw. Any ideas how I can take the old factory fence off, the right wing off and add the Unifence and table without my wife noticing that I spent the butter and egg money? SWMBO and I have danced that dance for years. I buy new toy, she discovers new toy, she confronts me, I tell her I've had that for a long time. I think we both know we're dancing. She did catch me once. I went to a hamfest (amateur radio flea market) and came home the proud owner of a used Tektronix 545 oscilloscope. For those who don't know, this is a big 'scope and it's on a cart, as well. The 'scope is approximately 16" high by 13" wide, by 24" deep, and weighs 65 lbs! The mobile cart puts the top of the 'scope at about chest level. This is not a subtle piece of equipment. I got it home and put it in the electronics corner of the basement and went about my business. Sometime later she came up from the basement and said, "what's that big thing in the basement?" “What thing?” I replied. Cha, cha, cha. “I don't have anything down there with a window.” Twirl. 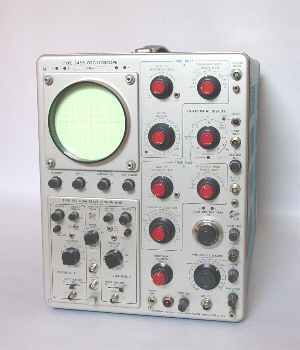 “Oh, you mean the oscilloscope? I've had that for a long time.” Dip. We celebrated our 37th wedding anniversary in 2007. The dance continues.